After a night hike from the village of Fredvang to the beach at Kvalvika, we were treated with a show. 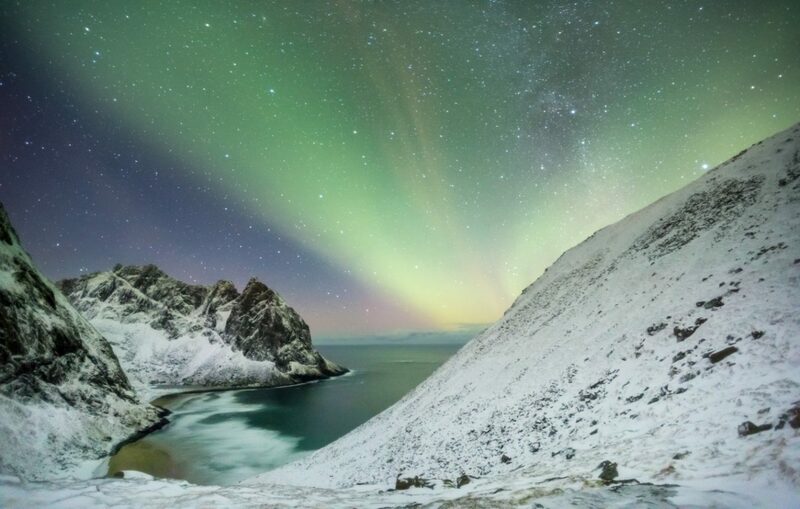 For a short time, the sky was lit up by Northern Lights. To the right of the photo, you can see the Milky Way through the curtains of the Aurora. The photo is a panorama assembled from three 45 seconds vertical photos. The camera was tracked at half sidereal speed using a Fornax LighTrack II mount. Half sidereal speed is perfect for shooting longer exposures when taking starscapes.